Our Birch Cream Caramels are rich, creamy and laced with pecans. 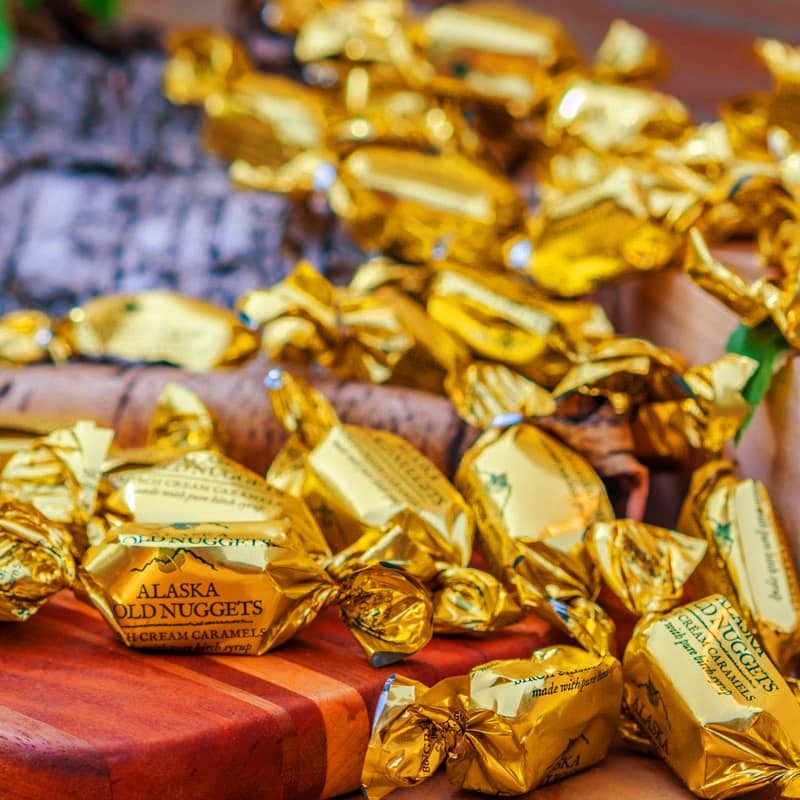 The candies are indiviudally wrapped in gold foil for a visual and culinary treat. Available in boxes or bags in several sizes. “Our Alaska Gold Nuggets are a bit like striking the mother lode…rich, smooth, and delightful! Sweetened with our own birch syrup – wild harvested from the sap of birch trees near Talkeetna – our caramels are a truly wild taste of Alaska. Enjoy the sweets of our labor!” So reads the story on the back of the bag … our very popular caramels are irresistible and mildly addicting! Available in 3 sizes in our classic gold-rimmed boxes, two sizes in our best-selling printed bags, and the best deal – a pound of gold in a simple and classy bag. Great for the holidays or sharing at any time of the year! Cane Sugar, Milk, Cream, Butter, Birch Syrup, Corn Syrup, Pecans, Lecithin. Contains dairy, nuts, corn, and soy.